When Mark first arrived in Formula Ford aged 17, he was already a remarkably seasoned competitor after many years of racing in motocross. Armed with family wealth and the "will to win", he contested 70 races that year. This propelled him into Formula Ford 2000 for the next two seasons, racing with - and often beating - rivals such as Damon Hill, Johnny Herbert and Bertrand Gachot. Most people would then have gone to Formula Three in 1987, but not Mark, who leapt directly to Formula 3000 without passing Go. A chance to drive for the works Lola team came his way in 1988, but this bombed after he had finished in second place in the opening round. Staying on for 1989, he had an even worse season, but sports cars came to his rescue and he drove with great speed for the works Nissan team. 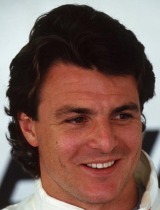 A test-driving contract for Williams followed in 1990, and Mark made his Formula One racing debut with Brabham in 1991. He was not an overnight success. Dropped to sports cars again in 1992, he was back in Formula One with Ligier in 1993 and scored third place first time out, ending up tenth overall. A move to Tyrrell in 1994 saw Mark suffer at the hands of Japanese team-mate Ukyo Katayama, raising cries of unfair treatment but, whichever way you look at it, it cost him the chance to stay on for 1995. Drafted into the McLaren line-up when Nigel Mansell could not fit into the car, he got the drive for keeps when Mansell quit. Mark brought the tricky car home in the points six times, but lost out in the chase for a Sauber ride in 1996, and moved on to become a race-winner in Indy Cars in 1997. Mark is now a TV pundit and driver manager.